The Kingston-Rhinecliff Bridge crosses the Hudson River about three miles north of the city of Kingston. 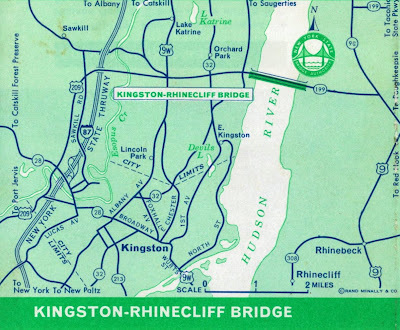 N.Y. State Route 199 crosses the Kingston- Rhinecliff Bridge and makes a connection by way of this route with the Taconic State Parkway and the New York State Thruway. Kingston-Rhinecliff Bridge is 7,793 feet long and was opened to traffic February 2,1957. 21. Kingston: “Gateway to the Catskills.” Of special interest is the Senate House (1676) where the state Senate met in its first session in 1777. Also of interest are the Old Dutch Church, and statues of Hudson, Clinton and Stuyvesant. 22. Hurley: Quaint 18th century colonial village. The Van Deusen House served as the temporary capitol of New York in 1777 which is worthwhile. 23. The Onteora Trail: Scenic State Route 28 along the north shore of Ashokan Reservoir (main source of New York City water) leads to the Catskill Mountains. 24. Pine Hill: Near here is the New York State Conservation Department Belleayre Mtn. Chair Lift, up the side of 3420 ft. Mt. Belleayre-from this vantage point sweeping views of the Catskills may be obtained. 25. Rhinebeck: Commercial Violet-anemone-delphinium growing center. The Beekman Arms believed to be the oldest hotel in the U.S. was established here in 1700. This entry was posted in Catskill Mountains, Hudson River Crossings, Hurley, Kingston, Kingston-Rhinecliff Bridge, Maps, New York State Bridge Authority, Pine Hill, Rhinecliff on July 10, 2012 by hudsonvalleygal.